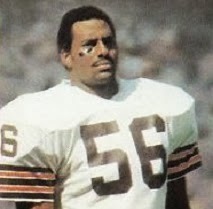 Highly rated coming out of college, Banks was chosen by the Browns in the first round of the 1982 NFL draft (third overall). Combined with the signing of LB Tom Cousineau, who had been playing with distinction in Canada, it was viewed as a major move to dramatically improve an underperforming defense. Banks moved directly into the starting lineup at left outside linebacker in the strike-shortened season. The Browns went 4-5 in the strike-shortened season and were eighth seed in the AFC playoff tournament that replaced the usual postseason format. Lost First Round playoff to Los Angeles Raiders (27-10). Banks followed up his outstanding rookie year by being even better in ’83, gaining consensus first-team All-NFL recognition as well as another selection to the Pro Bowl. He was fast and strong, good against both the run and the pass. Following a lesser year in 1984, he bounced back to reach the Pro Bowl twice more in 1985 (when he had a career-high 11 sacks) and ’86. However, he had also developed a reputation as a malcontent off the field and was traded to San Diego in 1987. He played well on the outside in combination with Billy Ray Smith, but was lost for all of all of ’88 due to a drug suspension. Reinstated, Banks moved on to the Colts during 1989 and played another three full seasons for them. He had 9 sacks in 1992, his last season, but never again achieved elite status. Overall, over the course of ten years Banks received All-NFL recognition once, was an All-AFC choice in four other seasons, and was named to the Pro Bowl on four occasions. He registered a total of 46 sacks (27.5 with Cleveland) and 9 interceptions, one of which he returned for a TD.